I was recently led by a database  and ultimately disappointed  to an issue of Vogue in 1948 containing reference to Reed. 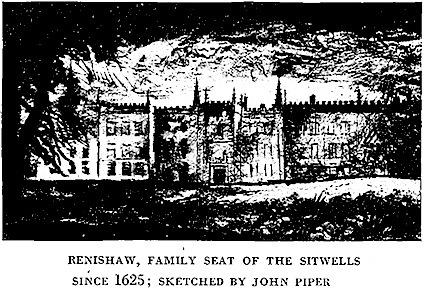 It was in an article on the Sitwell dynasty: Edith, Sacheverell, and Osbert Sitwell. The article, which appeared in the November 15 issue, "The Importance of Being the Sitwells," has a layout of paintings and photographs, while the text consists of pullquotes and anecdotes concerning the trio (mostly Dame Edith, let's be honest) from a myriad of sources. Reed's paragraphs (on the last page), are sourced as being from Denys Val Baker's 1946 anthology Writers of Today; but ultimately that's just a reprint of his 1944 article from Penguin New Writing, "The Poetry of Edith Sitwell." Osbert Sitwell was a huge influence on Reed's development as a poet and writer: he brought Reed under his wing introduced the young poet to what must have previously seemed like an unreachable circle of writers and musicians, actors and artists. Sitwell was chairman of the Society of Authors when Reed was given a bursary to support his writing in 1945: £200 per year for three years. Reed lunched with Edith Sitwell in London at Osbert's urging; Osbert sent Reed to visit Violet Gordon-Woodhouse during the Blitz. The Scarlet Tree, by Osbert Sitwell (Macmillan, 15s.) has an advantage over many autobiographies: it is written by an experienced novelist, who is here turning into art a richer material than he has used elsewhere, and who is partly employing the novelist's craft in shaping it. Who else but a novelist could contrive the checks upon racing Time which we find in this book, the disposition of a heavy emphasis here, a light one there, the holding back of an explanation till "later," the anticipations, the use of suspense, and above all the carefully-timed entrances and re-entrances of the characters? In biography Sir Osbert Sitwell's contrivances would be intolerable; in autobiography they are a blessing: There is something else which strikes one as one compares this book with a novel: because this is life, and not fiction, certain characters with traits which would in a novel be unacceptable outside the broadest farce are acceptable here. Where, in a novel, after our acquaintance with a character, has extended over several hundred pages, could we believe the, statement that he had "invented a musical toothbrush The Scarlet Tree which played 'Annie Laurie' as you brushed your teeth, and a small revolver for shooting wasps?" Sir George Sitwell, the author's father, is said to have invented both of these; perhaps they worked; but we should be rather incensed by the idea in a novel. So that, throughout, The Scarlet Tree has all the virtues of a large-scale discursive roman fleuve, with none of the restrictions of probability that a serious novelist has to impose on himself. But, in fact, they got on well together, in spite of their differing so often in the opinions they put forward. In the past, however, certain disputes had taken place occasionally, so that each sister has pasted somewhere on every article of furniture belonging to her  whether it were an oak chair, a table, a bronze, a chased-silver photograph-frame, or merely a Japanese vase full of last year's pampas-grass  a label, which bore on it in clear, black, decisive letters, admitting of no question, the name FLORA or FREDERICA. Thus, if either of them decided of a sudden to quit, she could accomplish it immediately, departing with her own belongings and without the possibility of further discord. But in its major intention The Scarlet Tree is a tragic, not a comic, book. Things which were treated comically, or hinted at in a non-committal tone neither of comedy nor of tragedy, in Left Hand, Right Hand, begin to develop more darkly here. And yet it is part of the novelist's art that the most lingering impression of the book is a quality not of darkness but of light. Indeed, descriptions of light are part of its scheme: Were is along Proustian meditation by the author while, as a child, he lies in bed at daybreak and feels the day increasing behind the shutters; there is another, a little later in life under the title of A Brief Escape into the Early Morning. Yet bathed in light though the book is  and one wishes that Mr. Piper's pictures had turned occasionally aside from their excruciating melodramatic gloom to try and recapture a little of this  the book is principally a picture of tragic childhood, of infant vitality, exuberance and perspicaciousness flickering against deepening shadows of older futility. 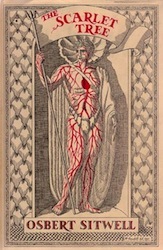 If, in fact, one or other of this distinguished family of writers has sometimes seemed, in print, a little too easily indignant or provoked; if they have had less difference to the censure which all writers of genius sometimes evoke than their admirers would like to see in them: then perhaps we find the reasons in The Scarlet Tree. But while the author employs much candour in speaking of his upbringing, he leaves it to his readers to make, if they choose, explicit comment on it. A critic may perhaps be allowed to describe it as horrible and appalling. No one can contemplate without misgiving those pathetically awful small children who are allowed a wholly uninhibited expression of their impulses, and who early realise with the natural cunning of children that there are no limits to how far they can go. But the opposite of this is scarcely better: the children rigorously subjected to the sort of well-meant cruelty  a complete divorce of ends and means  which permitted Sir George Sitwell always to insist that his children should do the exact opposite of anything they showed pleasurable inclination towards. Yet it is not to be imagined that Sir Osbert presents his father in the familiar guise of an Edward Moulton-Barrett [father of Elizabeth Barrett-Browning]. The most subtle and original thing in this book is the suggestion it gives that all early development is haphazardly circumstanced: it is a crawl through a garden wilderness where the cruellest briars and the largest fallen branches which impede the way pave also once had their struggles for existence and growth. It is a wise sense of this that persuades, Sir Osbert in talking of his own upbringing to open out for us a remoter vista: the childhood of his father. Here, having watched the development of a character, as seen by a child, a son, the reader may ask why my father so continually insisted on being in the right, to the extent that if events proved to him that he had been wrong, and he could no longer avoid such a conclusion, he had to fall ill... The reason, I deduce, must be sought a long way back, in the 'sixties of the previous century when he was a small child... I used to think that his disposition and his whims, sometimes so delightful and removed from reality, at others so harsh, and, indeed, hateful, were the result of his having been brought up entirely by women since the age of two, when, as we have seen, he succeeded his father; were rooted in the circumstance that he had never been controlled or disciplined or contradicted, and that, further, he had inherited an ample fortune at the age of twenty-one, finding himself, in fact, one of those local princes of whom Meredith tells us in The Ordeal of Richard Feverel. But my father had always maintained that his mother, though, by the time I knew her, gentle and on occasion almost indulgent, had not  for she was one of a family of five daughters  understood how a boy should be managed, and had treated him  of course without meaning to do so, for she was utterly devoted to him  with severity, and sometimes almost with cruelty.... And I have come to believe that this was true since I found in 1938 in the library at Renishaw a forbidding-looking account-book, short and thick, with an ecclesiastical clasp of brass. I opened this volume at random, and my eye lit on a page, not devoted to figures, on which were written, in a round, childish hand, very different from that which I knew, and yet even then recognisable, the words "George naughty again Jan. 20th." From the character of the letters, he plainly could not have been more than six or seven when obliged to enter that sentence. Underneath was inscribed in my grandmother's beautiful, flowing hand, "George naughty a second time Jan. 20th." There are many variations in the book on the theme of semi-conscious paternal bullying; and there is a good deal of its painful counterpart, semi-conscious maternal indifference. Lady Ida Sitwell could also be cruel  and in a perhaps more despicable way  but a part of her was all on the side of kindness, and it seems to have been easily played on by the unscrupulous; but the actions of her life, according to the testimony of a son whose completely affectionate attitude to her cannot be questioned, were principally dedicated to the pursuit of "fun"; and to such a temperament as hers, children provide little. Where it was most craved, therefore, her kindness was something least forthcoming. Yet there is an element of "attack" in Sir Osbert's account of his upbringing, though some things  among them his mother's attitude to his sister  cannot be treated with complete equanimity; but about his own injuries he has come to that state of comparative calm (it is nothing so smug as forgiveness, which: is always rather an indecent gesture on the part of a human being) the attainment of which is part of every artist's task. The school restored to my parents a different boy, unrecognisable, with no pride in his appearance, no ability to concentrate, with health impaired for many years, if not for life, secretive, with no love of books, and an impartial hatred for both work and games, with few qualities left and none acquired, save a love of solitude and a cynical disbelief, firmly established, in any sense of fair play or prevailing standard, of human conduct. He has no hesitation  why should he have?  in making clear who or what helped to undo this mischief. Principally, himself; but some things in addition which were denied to many of his companions. There was the calm beauty of Renishaw; there were his own growing apprehensions of the things man has formed out of the mess of life; there was Italy. It is a tempting preciosity to say that the Englishman's education and sensibility are incomplete without Mediterranean experience. It is also a palpable falsity; they are equally incomplete without experience of the South Seas, China, Russia and India. But to the English artist (to say nothing of anyone else) Italy has a strange power of benediction  more potent and residual perhaps when no attempt is made by the Englishman to externalise, its beauty into art; Sir Osbert is not, of course, the Englishman Italianate who incurred and deserved Elizabethan censure; but now that the centre of diabolism seems temporarily to have moved to Paris, it is delicious to find the magic of Italy restored in pages that are among the best in the book. The remarkable achievement of The Scarlet Tree is its avoidance of an episodic character. No writer of our time  unless perhaps Mr. William Plomer in his own autobiography  has shown greater delight in the unusual and absurd sideshows of human behaviour, or more tenacity in storing them up, for future reference. But in The Scarlet Tree anecdotes are used only as occasional illustration to the general succession of the "movements" of life. It is not a book which over-emphasises detail at the expense of form: the whole work, of which this is said to be a quarter (though one prefers to hope that it will be but an eighth or a twelfth) promises to be a masterpiece of controlled expansiveness; it has already a quality of humorous and urbane magnificence, and a romantic lyricism rare in contemporary prose. It is worth while remembering that this is achieved in spite of rather than because of the author's native background. Our times provide us with a new opportunity for snobbism which we eagerly grasp at; with a gracious smile we accept socialism, and with a wider one we indicate how much we are giving up. The author of The Scarlet Tree knows all this; and he is at pains to show in these Edwardian chapters what sterile dramas could enact themselves, what futile games be played, against the background of Renishaw. He insists that the notable qualities of himself, and of his brother and sister, are qualities of mind. These they brought with them; they did not find them there. Who could read all that and not put both Left Hand, Right Hand and The Scarlet Tree on their wishlist?